Astronomers using the Atacama Large Millimeter/submillimeter Array (ALMA) may have detected the dusty hallmarks of an entire family of Pluto-size objects swarming around an adolescent version of our own Sun. 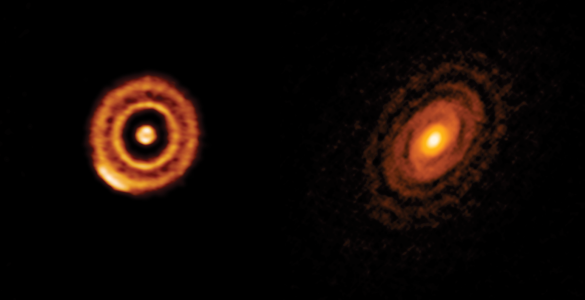 By making detailed observations of the protoplanetary disk surrounding the star known as HD 107146, the astronomers detected an unexpected increase in the concentration of millimeter-size dust grains in the disk’s outer reaches. This surprising increase, which begins remarkably far — about 13 billion kilometers — from the host star, may be the result of Pluto-size planetesimals stirring up the region, causing smaller objects to collide and blast themselves apart. Dust in debris disks typically comes from material left over from the formation of planets. Very early in the lifespan of the disk, this dust is continuously replenished by collisions of larger bodies, such as comets and asteroids. In mature solar systems with fully formed planets, comparatively little dust remains. In between these two ages — when a solar system is in its awkward teenage years — certain models predict that the concentration of dust would be much denser in the most distant regions of the disk. This is precisely what ALMA has found. 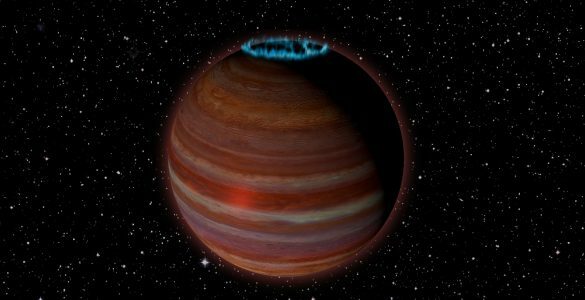 “The dust in HD 107146 reveals this very interesting feature — it gets thicker in the very distant outer reaches of the star’s disk,” said Luca Ricci, an astronomer at the Harvard-Smithsonian Center for Astrophysics in Cambridge, Massachusetts, and lead author on a paper accepted for publication in the Astrophysical Journal. At the time of the observations, Ricci was with the California Institute of Technology in Pasadena. “The surprising aspect is that this is the opposite of what we see in younger primordial disks where the dust is denser near the star. It is possible that we caught this particular debris disk at a stage in which Pluto-size planetesimals are forming right now in the outer disk while other Pluto-size bodies have already formed closer to the star,” said Ricci. 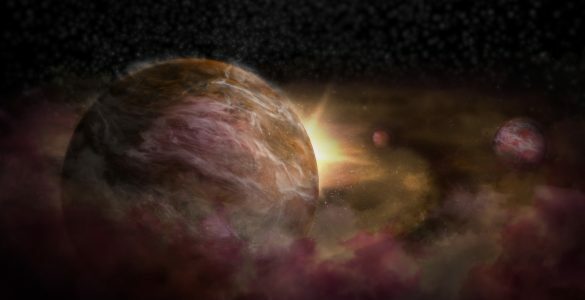 According to current computer models, the observation that the density of dust is higher in the outer regions of the disk can only be explained by the presence of recently formed Pluto-size bodies. Their gravity would disturb smaller planetesimals, causing more frequent collisions that generate the dust ALMA sees. 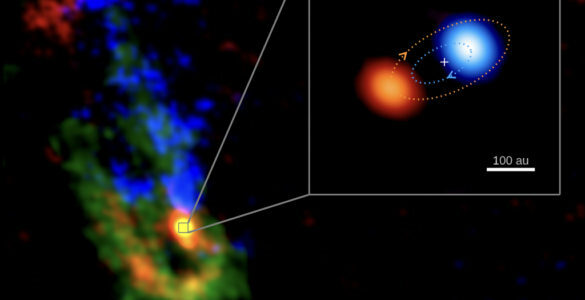 The new ALMA data also hint at another intriguing feature in the outer reaches of the disk: a possible “dip” or depression in the dust about 1.2 billion kilometer wide, beginning approximately 2.5 times the distance of the Sun to Neptune from the central star. Though only suggested in these preliminary observations, this depression could be a gap in the disk, which would be indicative of an Earth-mass planet sweeping the area clear of debris. Such a feature would have important implications for the possible planet-like inhabitants of this disk and may suggest that Earth-size planets could form in an entirely new range of orbits than have ever been seen before. The star HD 107146 is of particular interest to astronomers because it is in many ways a younger version of our own Sun. It also represents a period of transition from a solar system’s early life to its more mature, final stages where planets have finished forming and have settled into their billions-of-years-long journeys around their host star. The star HD 107146 is located approximately 90 light-years from Earth in the direction of the constellation Coma Berenices. It is approximately 100 million years old. 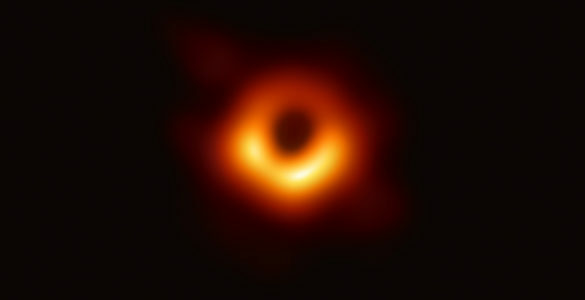 Further observations with ALMA’s new long baseline, high resolution capabilities will shed more light on the dynamics and composition of this intriguing object. Additional authors on the paper include John M. Carpenter and B. Fu, Caltech; A. M. Hughes, Wesleyan University; and Andrea Isella, Rice University. The Atacama Large Millimeter/submillimeter Array (ALMA), an international astronomy facility, is a partnership of Europe, North America and East Asia in cooperation with the Republic of Chile. ALMA is funded in Europe by the European Organization for Astronomical Research in the Southern Hemisphere (ESO), in North America by the U.S. National Science Foundation (NSF) in cooperation with the National Research Council of Canada (NRC) and the National Science Council of Taiwan (NSC) and in East Asia by the National Institutes of Natural Sciences (NINS) of Japan in cooperation with the Academia Sinica (AS) in Taiwan and the Korea Astronomy and Space Science Institute (KASI). 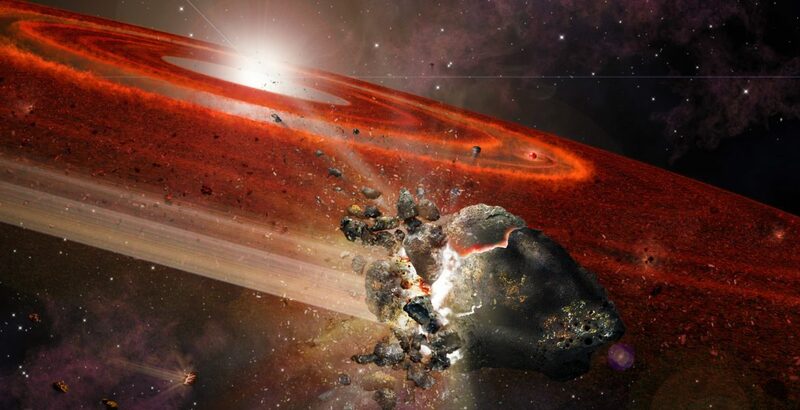 Artist impression of the debris disk around HD 107146. 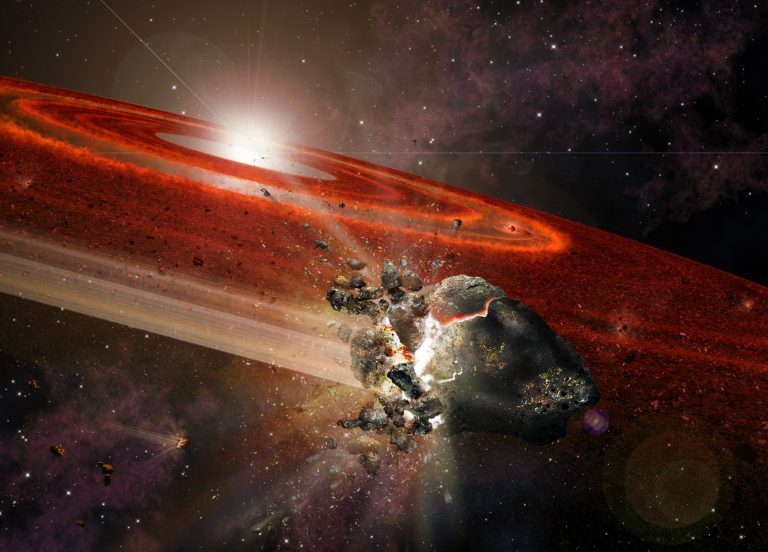 This adolescent star system shows signs that in its outer reaches, swarms of Pluto-size objects are jostling nearby smaller objects, causing them to collide and "kick up" considerable dust. 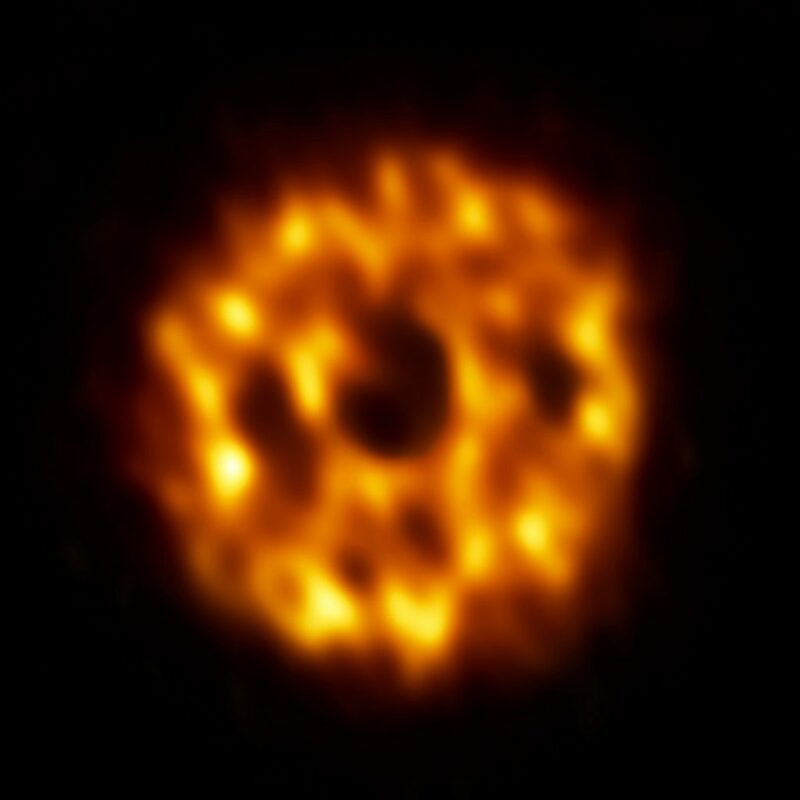 ALMA image of the dust surrounding the star HD 107146. Dust in the outer reaches of the disk is thicker than in the inner regions, suggesting that a swarm of Pluto-size planetesimals is causing smaller objects to smash together. The dark ring-like structure in the middle portion of the disk may be evidence of a gap where a planet is sweeping its orbit clear of dust. Astronomers have used the VLA to detect a possible planetary-mass object with a surprisingly powerful magnetic field some 20 light-years from Earth. It can help scientists better understand magnetic processes on stars and planets. Two independent teams of astronomers have uncovered convincing evidence that three young planets are in orbit around an infant star known as HD 163296. 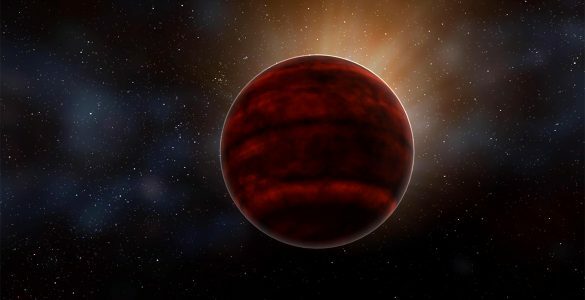 Using a new planet-finding strategy, the astronomers identified three discrete disturbances in a young star’s gas-filled disk: the strongest evidence yet that newly formed planets are in orbit there. ALMA data reveal that a powerful stellar flare erupted from Proxima Centauri last March. This space weather may make that system rather inhospitable to life after all.